Ever wanted to pilot a tank on an alien world while blasting enemies and flying saucers to bits? Well, once upon a time in 1980, that was possible. And when Battlezone comes out on Xbox Live tomorrow, you can do it all over again. The new game will include both the updated online multiplayer version, and the original vector graphic classic. Back in the day when a quarter could put you in command of a tank light-years from home, making change could turn you into a hero. Find out everything you ever wanted to know about the original Battlezone below. 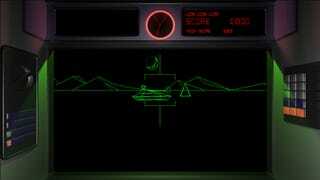 Battlezone was developed in 1979 by Atari and released in 1980. Morgan Hoff at Atari was the lead designer, and Ed Rotberg served as the principal programmer. Both had worked on many of Atari's other classic games. Battlezone was a tank simulator that gave you two joysticks, one for the left tread and one for the right, and a single button that fired your gun. You would drive all over an alien landscape, complete with an erupting volcano, and blast enemy tanks and spaceships while dodging simple geometric shapes. In addition, the screen would "crack" when you were killed by an enemy, and would also play Tchaikovsky's 1812 Overture when you would enter your initials for the high score. Battlezone incorporated many new design elements that hadn't been seen in coin-operated games before, like a persicope-like viewer and realistic (for the time) simulated tank driving. The game also featured a built-in step to allow shorter gamers to reach the periscope. The game featured wire-frame vector graphics in black and white, but they overlaid red and green cellophane onto the monitor to make it look like the game actually had different colors. The radar and warning messages were in red, while the main graphics were in green. Once the game was released, it was an instant hit. In fact, it became so popular that the United States Army approached Atari and had them design a version of the game that would train gunners on the Bradley Fighting Vehicle. Only two prototypes were produced that featured realistically modeled enemy helicopters, tanks, and other vehicles. Ed Rotberg was so incensed that Atari was getting involved with the military, that he had several shouting matches with his bosses. He agreed only to stay on at Atari as long as he never had to work on another military project again. Because players covered up most of the game with their face and body, other editions were designed like one without the periscope (because of concerns over hygiene as well, with everyone pressing their faces up against the viewer) and a cocktail table prototype. Rumors persisted that you could drive up to the volcano, enter a secret passage, and then find and explore a castle. Also, people thought that if you continued driving straight for over an hour (!) you could eventually reach the mountains and find a tank factory that was building the enemy tanks. Sadly, neither were true. Red Baron was a game released almost a year after Battlezone, featuring similar wire-frame graphics and gameplay except sit in a World War I biplane instead of a futuristic tank on an alien world. In fact, many Red Baron cabinets were just conversions of Battlezone units, and you could peel off the Red Baron stickers revealing the Battlezone artwork underneath. Battlezone remained popular much longer than most games that came out at the same time, and several different versions of been produced over the years. The game was ported to just about every home and portable video game system, and there were multiplayer versions and sequels produced for PCs. In Battlezone, the 1998 remake for PCs, they included an actual story. Meteors fall on the Earth in 1957, and the Americans and Soviets find a rare element inside them called bio-metal, which lets them build vehicles with special abilities. Of course, the Soviets and Americans use this ability to wage war across the solar system rather than better mankind. Peter Hirschberg is an amazing computer animator and arcade owner who frequent makes 3D models of old arcade cabinets in his spare time. He contributed models to the retro-gaming documentary Chasing Ghosts, and you can check out his Battlezone and Tron models here. Keep in mind there are completely rendered in the computer, and are not photographs or filmed images.